Belongil is amongst the long stretch of sandy beaches that line the Byron coastline. 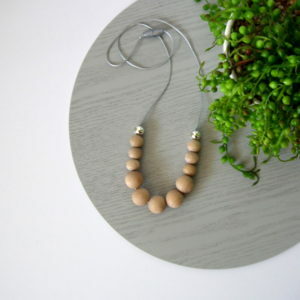 The golden round Beech wood beads are like the natural grains of the sand, and the pop of colour Silicone beads represent the headland at the end of the beaches. This necklace is uncomplicated. Her raw beauty is in her natural tones. This necklace is one of our longer necklaces and is on a 90cm nylon cord with Breakaway clasp. Silicone beads are 100% Non-toxic. Our Silicone beads are made from Food Grade silicone and are free from BPA, Lead, Cadmium, Phthalates, PVC and Latex! They do not support the growth of mould or bacteria. All our beads are tested and comply with Australian Standard AS/NZS ISO 8124.3:2012. Beech wood is naturally anti-bacterial and has a higher shock resistance than most other wood. All our beads are tested and comply with Australian Standard AS/NZS ISO 8124.3:2012. Wash over beads with a damp cloth. Do not submerge the Beech wood bead in water as it may discolour or warp the shape of the beech wood bead. We recommend coating your Beech wood beads in food grade oil such as Coconut Oil to help prolong the longevity of the bead and protect it from moisture. Please do not leave children under 3 years of age unsupervised with jewellery. Never let children under 3 years of age wear jewellery. Jewellery is NOT a toy! Want a different Length, Material or Cord style? Send us a message first and we can work with you to create the perfect fit!